Seattle, WA, June 27, 2017 – Uptime Institute today announced the company has completed its 1000th certification and is experiencing substantial growth in all geographies worldwide. Over the past five years, Tier certifications have more than tripled, reflecting the global industry demand for predictable levels of performance that can only be achieved through an impartial assessment of the design, construction, overall efficiency, and operational reliability of business-critical infrastructure. Uptime Institute’s Tier Standard is the industry’s de facto standard for data center performance and reliability. Based on performance objectives and behaviors, Uptime Institute’s Tier Standard is timeless and is designed to be flexible in approach and adaptable to the latest technologies and economics. Additionally, Uptime Institute continuously expands its business services assessment portfolio, introducing new programs like Management and Operations (M&O) reviews and the Efficient IT Stamp of Approval. 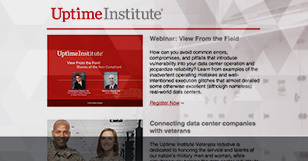 Rather than specifying specific technologies or rigid design requirements and operational processes, the Uptime Institute portfolio of offerings are objective-based, which means each solution accommodates new technologies and innovative approaches to data center design, build and operations to make them highly efficient and predictable. Uptime Institute continues to expand with the addition of new teams of professional engineering practitioners located in all major regions, along with adding two key senior executives to keep up with client demand. Key new hires include Matt Thoene, senior vice president, global operations and Mark Harris, senior vice president of marketing. Both individuals bring to the organization extensive data center and IT Infrastructure experience along with their core sales and marketing expertise. Uptime Institute ­­– The Global Data Center Authority®, a division of The 451 Group, has office locations in the U.S., Mexico, Costa Rica, Brazil, U.K., Spain, U.A.E., Russia, Taiwan, Singapore, and Malaysia. Uptime Institute получил аккредитацию CPD по всем предложениям. Uptime Institute Symposium: China Announced in Shanghai 22 март 2017 г.
Ли Кёрби (R. Lee Kirby) назначен президентом Uptime Institute. © 2013-2019 Uptime Institute, LLC. Все права защищены.